I am 48 years old and my life revolves around my ferrets and rabbiting. I am a full-time professional rabbit controller between August and March, and I demonstrate at over 25 game and country shows in the spring and summer. In between, I write for The Shooting Times and Country Magazine, film and edit YouTube films, and act as a consultant to many media and production companies. I have been ferreting for around thirty five years. 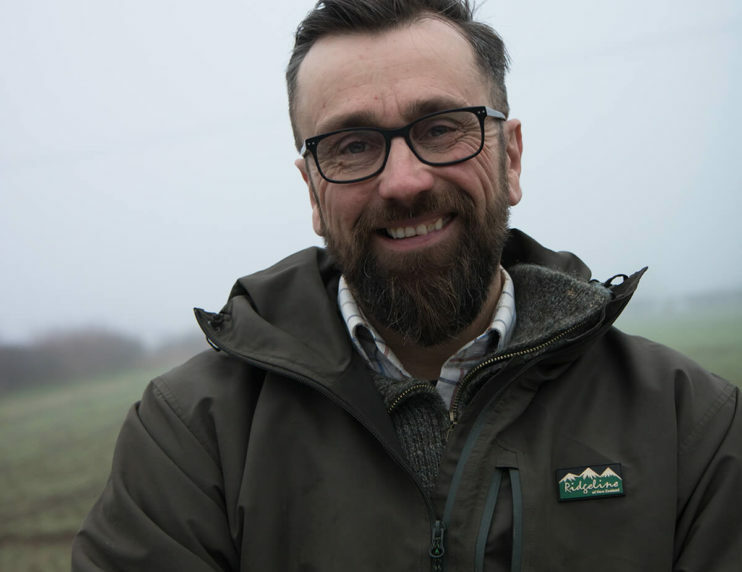 My passion for ferreting started when my family moved from the North East of England to Suffolk in the early 1980s. While I only owned and worked one ferret back then, I usually run around 25 per season now. This is usually a 70/30 hobs to jill ratio. These ferrets have been selectively bred by myself after seeking the most appropriate strains from around the UK and tested to the hilt. What I look for in one of my working ferrets is very personal. I need a driven ferret that knows exactly what its instincts are telling it. It must have plenty of social skills and be of moderate to large build. I can build its stamina up as the season goes on, but as a rule they are extremely fit and agile ferrets. Due to the rise in temperatures and growth in cover I normally use white or light ferrets but in the end, if they are good enough, then the colour is right. Here in the UK, ferreting is an ancient tradition that involves using a ferret to bolt a rabbit and then catching the fleeing rabbit. Many use nets, dogs, or guns to catch and kill the rabbits, but a few use a harris hawk. This is a personal choice, depending on how intense your ferreting is. At the end of the day, it matters little to the ferret; they do what good ferrets do. A typical day’s ferreting usually starts with the ferrets being selected and placed inside separate carrying boxes that usually hold 2 to 3 ferrets each. I then go to the area in which I am working, look over the warrens, and then decide my plan of action. I get my lurcher (a sight hound mated with a working dog breed) out to mark the warrens and if there is nothing at home, I continue down the hedge or field until we find what we are looking for. I then lay the nets (long or purse) and place electronic ferret finder collars on every ferret I am about to work. In an ideal world, the ferrets are placed inside the warrens and all of the rabbits bolt, but that is only textbook ferreting. In the real world, I have to locate and dig out a ferret from time to time. Once I am satisfied that there are no more live rabbits at home, we get the ferrets, box them up, fill in the holes and lift the nets to go onto the next warren. This all sounds very simplistic, but it is the skill of carrying this out that makes it look easier than it actually is. Experience is a great teacher in ferreting. The ferrets are fed a varied diet. For the first year of their lives, they eat nothing but wild rabbit with fur left on, and after that they go onto Alpha Ferret Feast during the summer and rabbit in the winter. The reason I feed rabbit when young is to cement their prey drive into their brains. At the end of the day I am only as good as my animals, so I must get this part of their upbringing right. They are free fed and that way they are neither full nor starving. As I look over my ferrets I decide which require less and which more food to keep their energy levels up. This could be more in the winter and less in the spring and summer due to the increase in temperature. I sometimes limit the amount of food as hobs can be greedy or they will hide uneaten food causing problems with flies and rot. Rabbit is undoubtedly their favourite food as they get so much enjoyment and exercise whilst using their jaws and paws to remove and eat the meat from the bone and sinew of the rabbit. I feel that in the present day working ferrets, although genetically are the same, mentally and physically are a completely different being to a pet ferret in the vast majority of cases. Physically they have a greater muscle mass, are usually more streamlined, and have a better diet. The main difference is the volume of their prey drive. 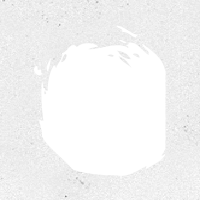 The prey drive is what drives them to locate and bolt a rabbit in a completely dark and black series of underground pipes and chambers. 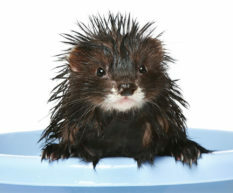 Pet ferrets have this bred out of them to make them more playable and suitable for life in a hutch or house. 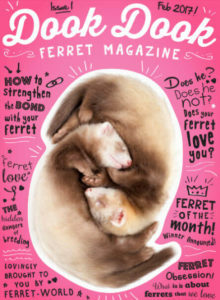 In my opinion, we have a lot to thank the pet ferret owners for. 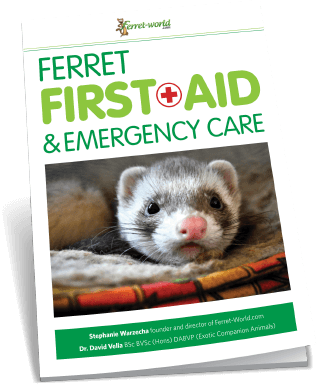 Vets are more knowledgeable about ferret health, and operations like the vasectomy and castrations are straightforward and easily gained. 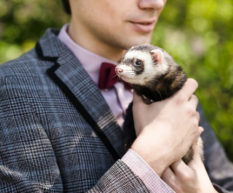 While I prefer to have working ferrets, I recognize that without pet ferret owners, vets would likely not be as experienced with ferrets as they are today. I have a live and let live attitude when it comes to keeping ferrets as workers vs. pets. My ferrets, the Pakefield Ferrets, are completely different beasts to any other in the world. I have selectively bred this line for nearly 30 years, hand picking the sires and dams, and working them very hard. I am also very hard in my selection process to which ferrets stay and which go to friends as pets or not-so-much working workers. This isn’t to everyone’s taste but the only person these ferrets have to please is me. My family depends on me and my ferrets, so I am driven to produce what I see as the perfect ferret for ferreting and keeping at home. All of my ferrets live in the garden in hutches and a central court system when not working. I could be ferreting 7 days a week, so by rotating which ferrets I work I reduce the risk of burnout. Because I breed and keep these ferrets in such a manner, all of their social skills are inherited by corrective handling by the time they mature. As these ferrets have a very strong working heritage, they take great delight in working. Of course, some ferrets are naturals and some take time. And even after the long breeding regime, some don’t make my grade but are far above what a recreational ferreter would want, so they have good homes. One of the eccentricities of my ferreting is that I never work any ferret if it hasn’t a ferret finder collar fitted. These ferrets either come above to look for scent and exhibit a proactive stance or wander looking for more rabbits because the warren is empty. 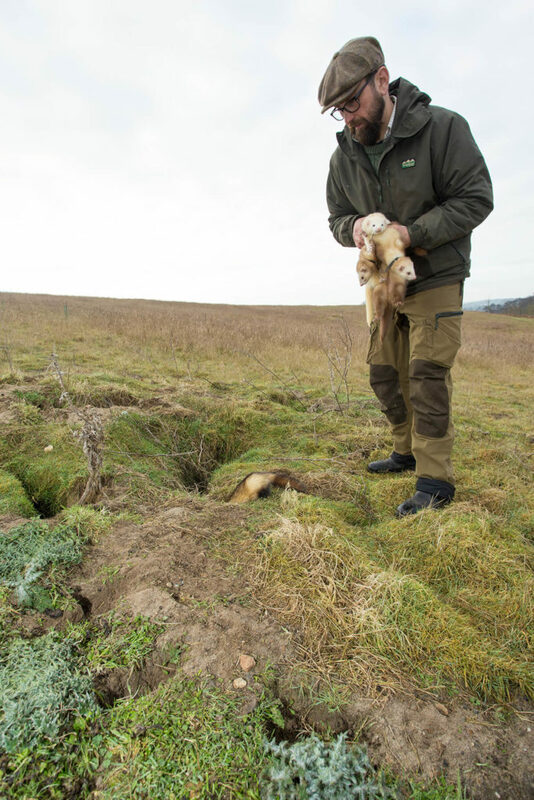 Sometimes the rabbits are stuck in a dead end and we have to locate them via the ferret finder and dig them out. Because I do this, I have never lost a ferret. However, I have had to use a JCB digger on a couple of occasions to dig from 12 to 16 feet to retrieve my ferret. Because I work my ferrets hard, the average age of mine is probably below the national average, at six years of age. The oldest I ever had was nine years, a small jill. When I demonstrate during the summer months at events, I use all of my old and retired ferrets. They have worked hard for me, so the least I can do is give them I cushy retirement. My ferrets rarely suffer from ailments. The most common are cysts caused by a bite of another ferret, rat or rabbit, but cysts don’t happen often. As a rule, a good breeding programme, husbandry, and top class food has given me strong and healthy DNA to breed from. Because I ferret a lot longer into the spring and summer, I have a lot of my hobs castrated to make working and living together easier. I have a vasectomized one to take my jills out of season, to avoid any undue stress or health issues related to prolonged seasons. I have never seen the need to vaccinate my ferrets because they don’t mix with others like show ferrets do. 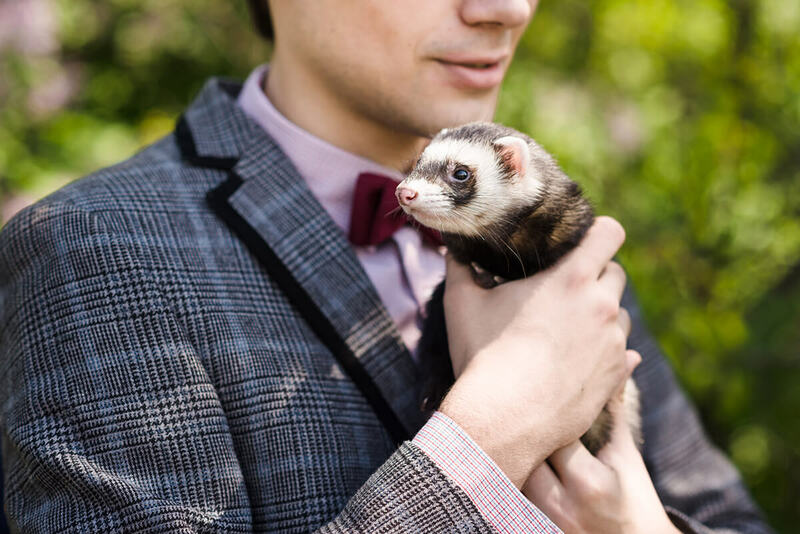 If there was one thing that ferret owners could do to provide a happier and healthier life, it is to look at the ferret’s needs sensibly and meet their dietary requirements. 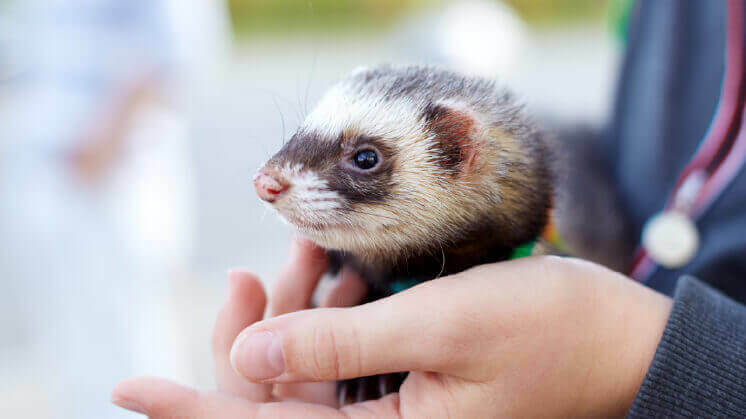 The secret recipe to any successful ferret is good housing, plenty of socialization, and a good diet that is formulated for ferrets’ dietary needs. 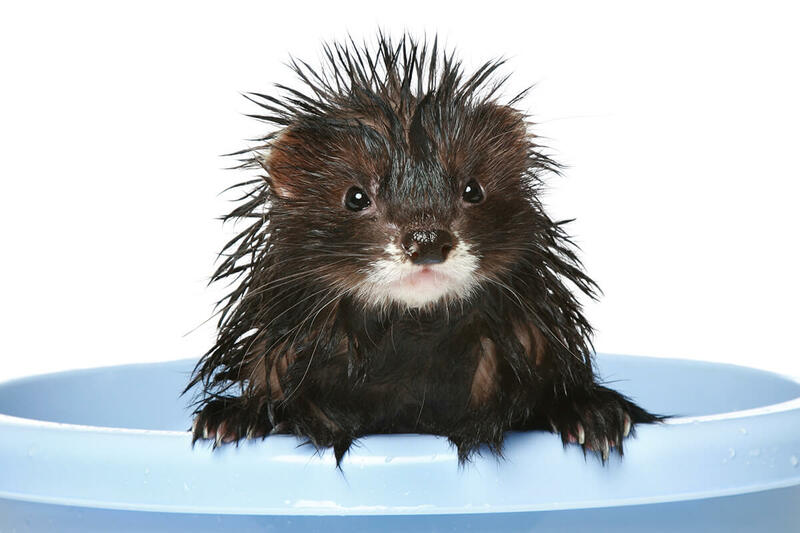 A healthy ferret is a good ferret, whether a pampered pet or prolific working machine. This is just a brief insight into my world of ferreting. If you want to look or learn more about ferreting, please look at my site www.pakefieldferrets.co.uk, follow me on Twitter (@SimonW001), or look at my YouTube page.